Earn $2.62 in VIP credit (262 points)What's This? 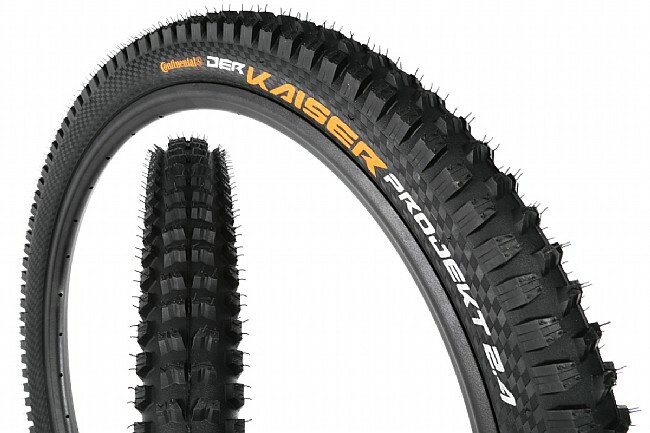 The Continental Der Kaiser Projekt 27.5 Inch MTB Tire provides a fast-rolling, durable tire that's capable of conquering even the most brutal trails. Whether it's an unexpected rock garden or an unforeseen tree root, take confidence that the Der Kaiser's ProTection Apex layer and 6-layer, 360 TPI casing will keep the wheels spinning and the tires fully inflated. With Continental's Black Chili® rubber compound, the Der Kaiser provides 30% more grip than standard rubber and is engineered to wear slowly for a long lifespan. Black Chili® rubber compound provides fast rolling, tacky grip. ProTection Apex layer provides durable protection from sidewall slashes and punctures.